A portable building affords convenience for schools, on building sites and even on mining sites. Whether it’s a large portable building, a portable office or a site building, when it comes time to move these buildings, it’s a job for a true heavy haulage expert. You can find a transport company who are highly skilled and with extensive experience in the tough operation that is transferring portable buildings. Heavy haulers operate throughout Australia, carrying oversized loads interstate, regionally and through metropolitan areas. Get quotes for portable building transport today! Get 3 Quotes for transporting portable buildings. It’s free to request quotes. What portable buildings are relocated? 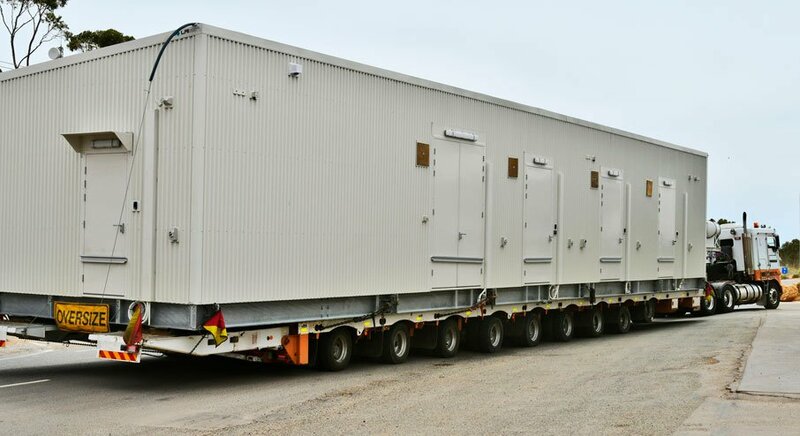 Oversized Building: Moving an oversized portable building is one of the biggest heavy haulage operations that takes place on Australian roads. Experts in heavy haulage who specialise in moving oversized portable buildings have the know-how to move these buildings and as to exactly how to divide the modular for transport. It’s a skilled area and you can find transport companies that specialise in oversized portable buildings. Portable Classroom: A portable classroom can be long, tall and wide and that makes them an oversized portable building load in many circumstances. If you need an oversized portable classroom load shifted then you’ll need to find a heavy haulage specialist to get your transport quotes and costs. Accommodation Buildings: If you need to have a transportable accommodation building relocated then you’ll have to find a dedicated and experienced heavy haulage expert as these buildings can be extremely large. Weatherboard Houses: Made a purchase of a new portable weatherboard home and need to relocate it to its new home? You will need to find a heavy haulage expert who has experience with loading, unloading and carrying oversized portable buildings and portable weather board homes. Site Buildings: Whether it’s interstate, through regional areas or just in metropolitan areas, you can find a heavy haulage expert to carry site buildings to construction, building and mining sites across and throughout Australia. Site Sheds: Site sheds are generally the same size as a 40ft shipping container, though sometimes they can be even larger. A crane truck can load a site shed or you can notify a transport company if a crane is available at the pickup and delivery sites. Dongas: Dongas are a great alternative and more affordable option than building a home. If you’ve made a new purchase and need to have one relocated to your address, then you’ll need to find a reliable transporter to perform that service for you. Granny Flat: A granny flat is one of the most commonly transported portable buildings and many people seek out transport quotes for granny flats. When it comes to portable building transport of a granny flat, you want to enlist the help of a heavy haulage specialist. Portable Cold Room: Portable refrigerated containers can be loaded and unloaded in a similar fashion as a shipping container. Generally, they are around the same size, either a 10ft, 20ft or 40ft portable cold room. They can be transported on a flat bed truck or trailer and loaded with a tilt tray or a crane. Portable Toilets/Portaloo: Regularly delivered to events and festivals as well as building and mining sites and festivals, portable toilets and portaloos are generally taken in multiples and can range into high numbers for a single event or site. If you need transport quotes to move multiple portable toilets and portaloos, you’ll need to find a reliable transport company to do so. Ablution Block: Toilet and shower blocks or ablution blocks are used in parks, at festivals and on mining sites as facilities for patrons and employees. This can be loaded and unloaded with the use of a crane truck or winched onto the back of a tilt tray truck or trailer. Bathroom Pods: Bathroom pods or modular bathrooms are utilised in the hospitality, accommodation and building industries and have become a popular and convenient alternative to building a bathroom from scratch. Loading is performed similar to a shipping container and you can find a truckie with the right type of vehicle to carry this freight. Amenities Building: Portable amenities buildings have become common place and are used within accommodation facilities such as caravan parks and on mining sites as semi-permanent facilities for workers. Shower Block: Portable shower blocks are utilised for events and businesses, as well as mining and construction sites. For that reason, you want to find a transport company who is able to transport the shower block on time to exactly where you need it delivered to. Demountable Buildings: Demountable buildings can be extremely large and, therefore, they require the services of a heavy haulage expert. To get transport quotes for these buildings you will need to include the dimensions of the demountable building and the pickup and delivery addresses. Portable buildings, site buildings and portable homes all offer a large element of convenience and ease yet the process of relocating them is a difficult and tough job that most individuals and businesses simply can’t comprehend. Luckily, there are experts in heavy haulage who carry oversized freight like portable buildings on a regular basis. FreightQuotes can connect you with these experienced transport companies. Simply submit a free online freight quote request with details of your portable building freight to get your transport quotes directly from three transporters. Simple, fast and no obligation to hire. Portable building transport is available Australia wide. This includes interstate, regional and metropolitan freight covering all states and capital cities including Adelaide, Brisbane, Perth, Darwin, Melbourne, Canberra, Hobart and Sydney. FreightQuotes can help you with shifting any type of freight including heavy haulage like shipping containers through to lighter freight like pallet loads.